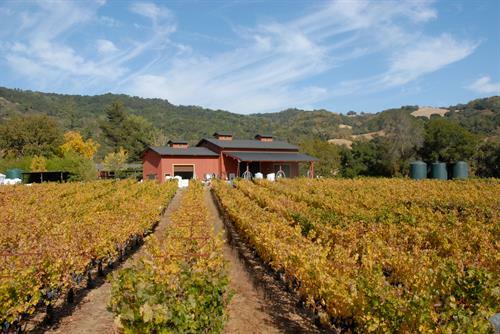 Martin Ranch Winery is a family-owned and operated winery and vineyard. We produce award-winning wines under the Thérèse Vineyards and J.D. Hurley labels - cabernet sauvignon, syrah, merlot, rose and much more. Bring your friends, family, and a picnic to enjoy the warmth and hospitality that is the San Martin Ranch Winery. Our appellation sits on the southeastern tip of the Santa Cruz Mountains, with beautiful mountain views on the historic Redwood Retreat Road. Come out to the winery on the third weekend, we would love to see you! From hwy 101 exit at Tennant Ave. heading west. At the 2nd light turn left on Butterfield Blvd which turns into Watsonville Rd. Travel for 6.2 mi. Turn right on Redwood Retreat Rd go .4 mi. to winery.